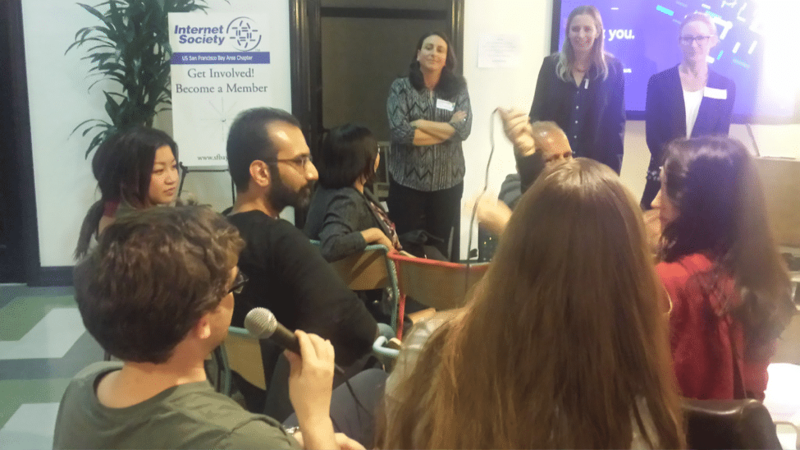 One thing was clear from a recent presentation by the new leaders of the SF-Bay Internet Society (ISOC) Chapter Working Groups, inclusion and collaboration will be the key to these groups’ success. As Dr. Brandie Nonnecke, the Internet Governance Working Group (WG) Chair said, “We haven’t yet cracked the code on what ‘multistakeholder’ means.” But that won’t stop her and Dr. Jaclyn Kerr, the Data Protection, Privacy, and Security WG Chair, from trying. 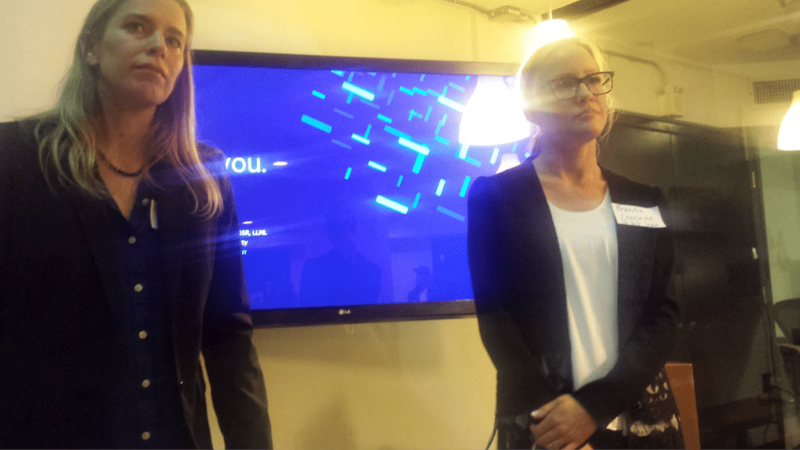 At a recent Chapter Event held on April 10th, 2017, these two innovative leaders laid out an ambitious plan to bridge silos and foster open dialogue in order to work towards the Internet Society’s mission that the Internet is for Everyone. From left: Chapter President & Chair Susannah Gray and WG Chairs Jaclyn Kerr and Brandie Nonnecke during the Q&A Session. These newly-launched Working Groups will focus on the interest areas of the SF Bay Area Chapter members, as determined by their responses to a recent survey. There are three in total: Internet Governance; Data Protection, Privacy & Security; and Internet of Things (IoT), Internet Technologies & Access. For the Internet Governance Working Group, Chair Brandie Nonnecke laid out a plan that includes supporting interdisciplinary research, publishing position papers and policy briefs, organizing workshops, symposia, and activities, and supporting a fellowship program. The goal is to educate and engage stakeholders not traditionally involved in Internet governance. Brandie is well-suited to achieve this goal: she is a PhD whose research focuses on multistakeholderism in internet governance and information and communication technology (ICT) policymaking at the Center of Information Technology Research in the Interest of Society (CITRIS) and the Banatao Institute, UC Berkeley. The WG group is now accepting members; help drive the agenda by applying to join the WG. WG Chairs Jaclyn Kerr (left) & Brandie Nonnecke listen to an audience member during the Q & A session. For the Data Protection, Privacy, and Security Working Group, Chair Jaclyn Kerr discussed the urgency of this issue: due to government surveillance and data breaches, there are serious threats to our online security and privacy. Even at the top level of government, there have been security breaches. Jaclyn discussed working in collaboration with the other WGs and fostering discussion between those involved in tech, civil society, civil liberties, security and academia. Jaclyn is as a Postdoctoral Research Fellow at the Center for Global Security Research (CGSR), Lawrence Livermore National Laboratory, where her research focuses on cybersecurity and information security strategy, Internet governance, and the Internet policies of non-democratic regimes. Apply to join this WG. And last but not least, in the IoT, Internet Technologies & Access Working Group, the focus will be on the IoT ecosystem, issues around access, critical Internet infrastructure, innovation and open standards. As more and more devices connect to the Internet, we need to ensure that security concerns, critical resources like IPv4 and IPv6 address space, and technology standards are addressed. Mischa Spiegelmock, who unfortunately could not attend the Chapter Event due to travel, chairs this WG. Mischa is software engineer who currently leads an engineering team at MVS Technical Group Inc., and specializes in information security, database-driven applications, systems programming, UNIX and C. To get involved, apply to join this WG. Get involved today by joining us and almost 2,000 other members (it’s free! ), emailing us with your thoughts, applying for open board seats, volunteering, donating, sponsoring the Chapter, or joining one of these powerful Working Groups. There is a reason Board Treasurer Ken Krechmer, one of the Chapter founders, called ISOC the “Continental congress of the Internet.” This is the basis for an open Internet. You can find the agenda from the April 10 Chapter Event and recording here.